New Ultra Telephoto Zoom Lens for superb image quality: LEICA DG VARIO-ELMARIT 50-200mm / F2.8-4.0 ASPH. / POWER O.I.S. H-ES50200 lens covers 100 mm to 400 mmi super telephoto with high mobility. 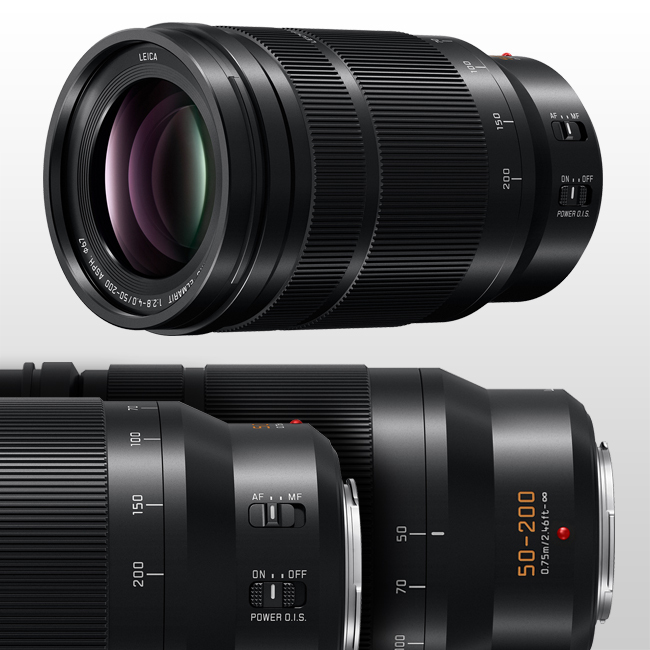 Panasonic has introduced a new telephoto zoom digital interchangeable lens, the LEICA DG VARIO-ELMARIT 50-200mm / F2.8-4.0 ASPH. / POWER O.I.S. (35 mm equivalent: 100-400 mm); the third lens in its LEICA DG VARIO-ELMARIT F2.8-4.0 Series. The 67mm filter thread allows for the use of ND and PL filters to further enhance the lens’ versatility. Two optional Teleconverters are available, the 2.0x DMW-TC20, which extends focusing distance to 800mm (35mm equivalent), and the 1.4x DMW-TC14 (560mm – 35mm equivalent). Particularly important when zooming and shooting distant subjects, the POWER O.I.S. (Optical Image Stabiliser) compensates for hand-shake, allowing shooting without a tripod. 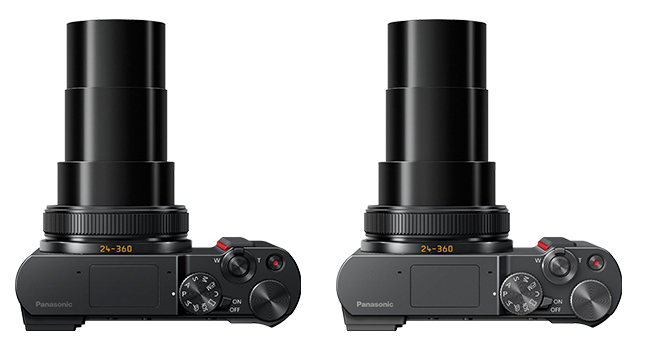 For powerful stabilisation, the lens works with Dual I.S.ii (Image Stabiliser) and the Dual.I.S.2iii system when mounted on compatible Panasonic LUMIX DSLM (Digital Single Lens Mirrorless) cameras. The LEICA DG VARIO-ELMARIT 50-200mm / F2.8-4.0 ASPH. / POWER O.I.S. lens (H-ES50200) offers excellent sharpness and precision for both photo and video recording; while achieving a compact mobility not possible in other camera systems. 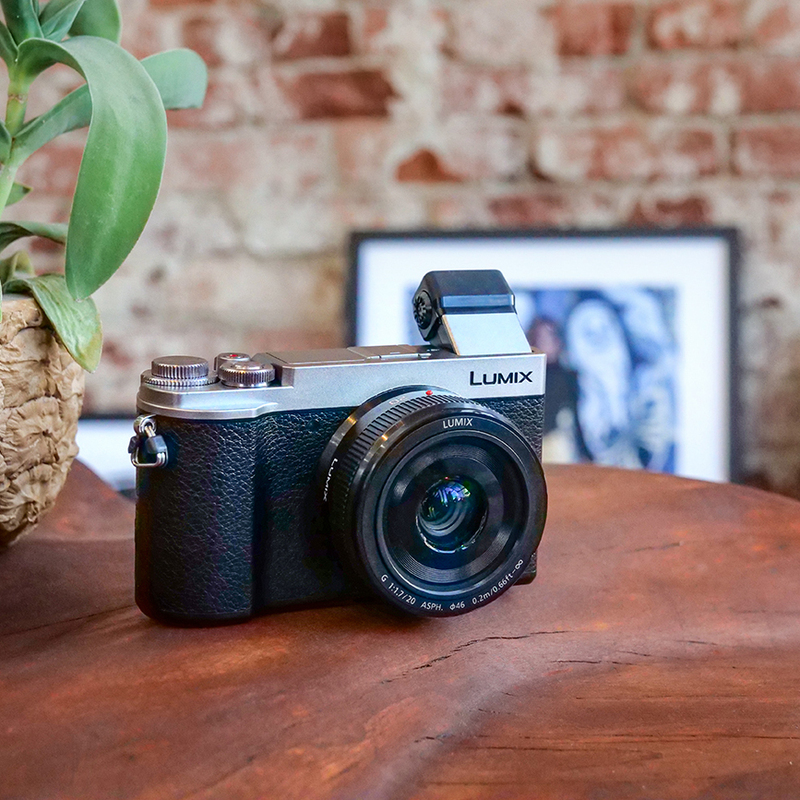 The rugged and stylish metallic black body is designed to match the latest LUMIX G cameras, including the GX9, G9, GH5 and GH5S. The H-ES50200 is priced at $2,299rrp, and will be available in Australia in June 2018 from photographic specialists and consumer electronics retailers. As with all lenses in the Series, the H-ES50200 has a rugged, dust and splash-proof design, is freeze-proof down to -10 degrees Celsius to withstand professional use under harsh conditions; and takes advantage of Panasonic’s Nano Surface Coating technology to minimise ghosts and flaring. High-quality video recording capability is also a key advantage of this lens Series. The H-ES50200 lens is compatible with the LUMIX G sensor drive at 240fps to take advantage of the high-speed, high-precision Contrast AF. The AF tracking performance in zooming is also enhanced with high-speed frame analysis for focus control. The new lens incorporates 21 elements in 15 groups, including two UED (Ultra Extra-low Dispersion) lenses, two ED (Extra-low Dispersion) lenses, two aspherical lenses and one UHR (Ultra High Refractive Index Lens) lens. These lenses and Panasonic’s cutting edge optical technology achieve high-resolution, high-contrast imaging from centre to corner while suppressing distortion and chromatic aberration. LEICA DG VARIO-ELMARIT 50-200mm / F2.8-4.0 ASPH. / POWER O.I.S. (H-ES50200). ii Dual I.S. can be used with LUMIX GX9, GX8 and GX85. iii Dual I.S.2 can be used with LUMIX G9, GH5, G85. 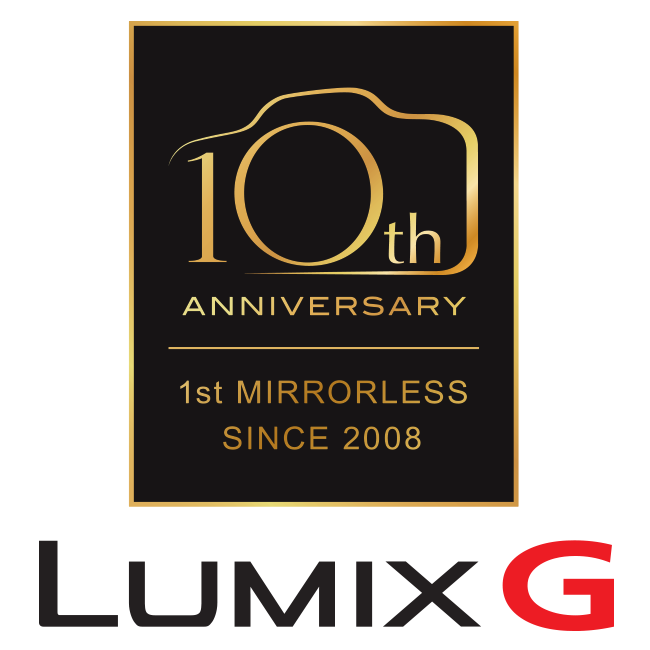 The year 2018 marks 10 years since Panasonic introduced the world’s first Digital Single Lens Mirrorless Camera, the LUMIX DMC-G1, in 2008i. Panasonic is a pioneer of the mirrorless camera and has led the market in pursuing unique technologies for high picture quality, high performance, high-speed response and video recording capability. Ground-breaking LUMIX achievements include the development of the LUMIX GH4, which enabled the world’s first 4K video recording capability in a mirrorless cameraii; the introduction of Dual I.S. (Image Stabiliser) with the GX8; and 6K PHOTOiii, released with the GH5, delivering high-speed burst shooting at 30 fps in 18-megapixel resolution with no time restrictions. Panasonic has recently expanded its lineup of cutting-edge digital cameras with world-acclaimed flagship models: including the LUMIX GH5, the ultimate hybrid camera; the LUMIX G9, which boasts uncompromising performance for still photography; and most recently the LUMIX GH5S, which brings the highest-ever sensitivity and video quality to the LUMIX range. Panasonic will continue to focus on developing high-end digital cameras that meet the stringent standards of professional photographers and video creators. Guided by the vision of “Changing Photography”, LUMIX will continue the development challenge over the next 10 years to further promote the company’s position as an industry innovator and introduce a steady stream of exciting new technologies. i For a Digital Interchangeable Lens System Camera, as of 31 October, 2008 (Panasonic survey). ii For a Digital Single Lens Mirrorless camera as of 4 January, 2017 (Panasonic survey). iii 6K PHOTO’ is a high speed burst shooting function that cuts a still image out of a 4:3 or 3:2 video footage with approx.18-megapixel (approx. 6000 x 3000 effective pixel count) that the 6K image manages. 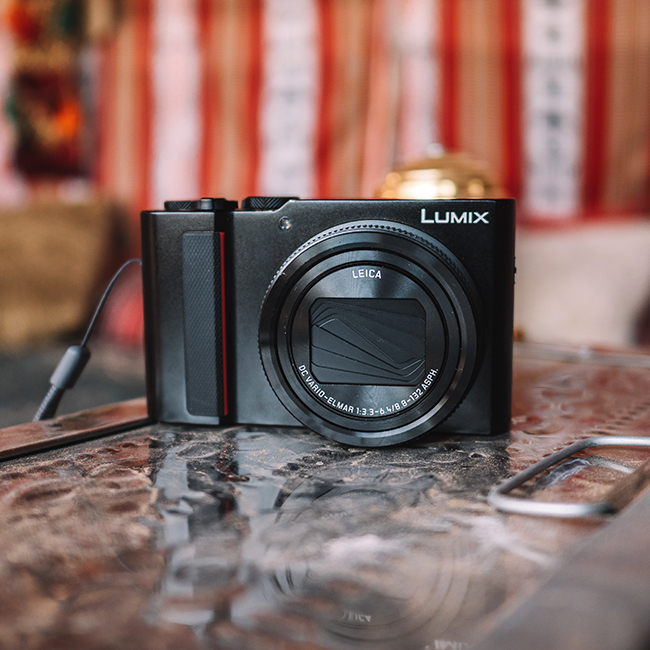 Panasonic is proud to introduce the LUMIX DC-TZ220, the latest flagship in its popular ‘Travel Zoom’ series. The ultimate in travel compacts, this premium camera delivers impressive performance and versatility with 15x zoom LEICA lens, 1-inch MOS sensor, and 2.3 million-dot Live View Finder with 0.53x magnification. LUMIX DC-TZ220 | RRP$1,199 | Available: April 2018. 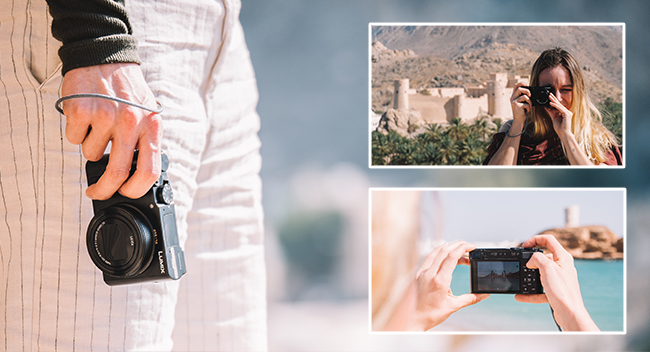 Now, photographers can perfectly capture even the finest details of their travels. The camera’s 20MP high sensitivity 1-inch MOS sensor with Venus Engine processor delivers incredibly sharp images with rich depth. Supporting this, the TZ220’s 15x zoom LEICA DC VARIO-ELMAR lens (24-360mm – 35mm camera equivalent) offers crystal clear images from high zoom to close-up shots, with a macro focusing distance as close as 3cm. For rock-steady zooming, the camera incorporates Panasonic’s latest image stabilisation technology – 5-Axis HYBRID O.I.S.+i (Optical Image Stabiliser Plus) – which compensates for hand-shake occurring in virtually any direction. A high-resolution viewfinder is key to ensuring once-in-a-lifetime shots are precisely framed and in sharp focus. Panasonic has equipped the TZ220 with a high quality 0.21-inch 2,330K-dot equiv. Live View Finder (LVF), with a high magnification ratio of approximately 1.45x / 0.53x (35mm camera equivalent). Image output between the LVF and the 1,240K-dot rear monitor is automatic, using an eye sensor on the LVF. The LVF and the 3-inch monitor provide approximately 100% field of view. DFD (Depth From Defocus) technologyii minimises focusing time, with a quick autofocus (AF) speed of around 0.1iiisec; and supports high-speed burst shooting at 10 (AFS)/6 (AFC) frames per second (fps) to capture fast-moving subjects in crisp detail. The lightweight, portable camera is available in a choice of black or dark silver, with a chassis using aluminum plates for durability, and grips at front and rear for stable shooting. In addition, the new eco30fps mode gives the LUMIX TZ220 a maximum battery life of around 370 images per chargeiv. The LUMIX DC-TZ220 will be available in Australia from photographic specialists and consumer electronics retailers. For further information, please visit www.panasonic.com.au or call 132 600. The LUMIX DC-GX9 offers uncompromising style and performance, in a form factor that’s ideal for mobile, candid street and travel shooting. The newest model in the classic ‘GX’ series of rangefinder-style cameras boasts incredible detail, outstanding low-light performance and impressive dynamic range, via Panasonic’s latest 20-megapixel Digital Live MOS Sensor (without Low Pass Filter) and the high-precision Venus Engine processor. Panasonic’s 5-axis Dual I.S.technology combines 5-axis internal stabilisation with the optical image stabilisation in selected lensesi.This advanced system ensures class-leading stabilisation from wide angle to telephoto, allowing shooters to leave their tripod at home and travel light. In addition, the electromagnetically-driven shutter system provides quiet, steady shooting. The GX9’s trademark tilting Live View Finder (LVF) offers 2,760K-dot equivalent resolution for excellent clarity and sharpness when shooting. The 16:9 LVF tilts up by around 80 degrees and has a high magnification of 1.39x/0.7x (35mm camera equivalent). A Power Saving LVF feature extends battery life to up to 900 images per chargeii. To support intuitive control, the LUMIX GX9 introduces an exposure dial for quick change of exposure settings, and a focus lever for quick adjustment between AFS (AFF)/AFC and manual focus. Building on this foundation, other features designed to deliver performance and convenience include responsive and rapid autofocus at 0.07iiisec; versatile 4K Photo and Video; and Bluetooth Low Energy connection to smartphones. The DC-GX9 will be available in Australia in April 2018 from photographic specialists and consumer electronics retailers. Colours available are: Black, or two-tone Silver and Black. DC-GX9 single lens kit with 12-32mm lens: RRP $1,399. Available: April 2018. At the heart of the GX9, the 20-megapixel Digital Live MOS sensor (without Low Pass Filter) and the high-precision Venus Engine processor deliver stunningly natural images. Three-dimensional Colour Control balances hue, saturation and brightness for rich colour reproduction from dark to light. High Precision Multi Process Noise Reduction both identifies noise and preserves detail, supporting low-light shooting at ISO 25600. The camera offers outstanding ergonomics with a 2,760K-dot equivalent LVF and approximately 1240K-dot touch monitor. An Eye Sensor is activated simply by looking into the viewfinder. The GX9’s trademark tilting viewfinder conveniently tilts up by approximately 80 degrees. This and the tilting monitor enable ‘shooting from the hip’, which is less confronting and allows the photographer to blend in to the environment and capture fleeting moments and lively streetscapes. Panasonic’s Dual I.S. technology can support up to 4iv stops of image stabilisation – enabling shooting still subjects handheld at slower shutter speeds and ISO values, as well as supporting telephoto focal lengths. Providing further aid to the photographer, the GX9 has excellent autofocus in low-light environments, with -4EV luminance detection in Low Light AF. Live View Boost allows scenes to be electronically illuminated in almost total darkness to check accuracy in Live View before shooting. The GX9 backs its excellent imaging credentials with Panasonic’s 4K suite. On this new model, Panasonic has made it easier to select the best shot from hundreds on a reel with Auto Marking, which highlights images that contain movement or faces. In addition, the new in-camera Sequence Composition function allows a sequence of images to be shown within one shot – for example the trajectory of a motorbike jump, the arc of a diver leaving the board, or the movement of a dancer. The GX9 also incorporates the full range of Panasonic’s 4K capabilities, including 4K Video with 4K Live Cropping for stable panning and zooming during recording; and 4K Photo with 4K Pre-burst mode which shoots 30 frames per second before and after the shutter is released. Light Composition mode saves the brightest pixels from a series of shots in-camera, to produce more dramatic images of night scenes such as fireworks. Post Focus mode allows the user to choose the focal point of an image after the shot has been taken, while Focus Stacking combines focal points to achieve complete foreground to background focus. For creative photography that’s reminiscent of classic black and white film, L.Monochrome D mode in Photo Style makes it possible to shoot dynamic black and white photos with emphasised highlights and shadows, while keeping detail. All three modes – Monochrome, L.Monochrome and L.Monochrome D – allow the grain effect to be adjusted between High/Standard/Low for more creative shooting. Photographers on the move can streamline sharing of images with smartphones using Bluetooth 4.2 Low Energy connection and 2.4GHz Wi-Fi® (IEEE 802.11b/g/n). With an always-on connection, images can be geotagged, and your smartphone can be used as a remote control. The GX9 can also be conveniently charged on the go via USB cable direct to the camera, anywhere there is a USB power source. i Firmware update is required for some lenses. ii Under the test conditions specified by Panasonic based on CIPA standard. When the time to get in the sleep mode is set to 1 sec. iii In AFS, at wide-end with H-FS14140 (CIPA). v Contrast AF with DFD Technology works only with Panasonic Micro Four Thirds lenses. vi In AFS, at wide-end with H-FS14140 (CIPA). 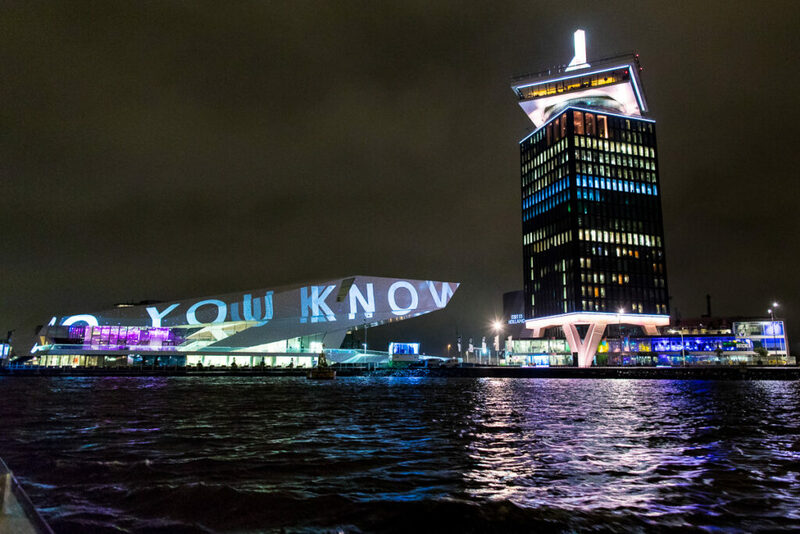 Panasonic has unveiled new 4K solutions at the ISE 2018 exhibition in Amsterdam, including a ‘beyond 4K’ 20,000 lumens laser projector and a 4K professional display lineup. “As Panasonic continues to expand its 4K AV solutions, our customers can expect to see these technologies in Australia later in 2018,” said Chris Maw, Product Marketing Manager, Media and Entertainment, Panasonic Australia. The PT-RQ22K beyond 4K laser projector is equipped with 4K+ (5120 x 3200) resolution and is aimed at live event staging, exhibitions, rental, and permanent installations where absolute reliability is critical. 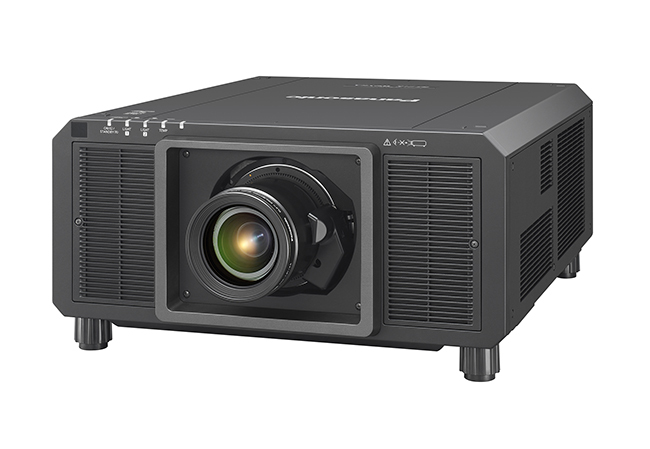 It meets the demand for a light weight, high-brightness 4K+ projector with film-like image quality, suitable for single or stacked projections. Panasonic is also broadening its lineup of 4K commercial displays with the announcement of the EQ1 six-model series of 4K LCD panels ranging from 43 inch to 86 inch. The new display series have a slim depth and stylish narrow bezel design which maximises the screen area, and 350 cd/m2 brightness, making them ideal for shopping centres, showrooms, meeting rooms, and classrooms. The two largest panels (86/75-inch) also feature In-Plane Switching technology, which maintains colour accuracy and clear visibility when the screen is viewed off-axis. 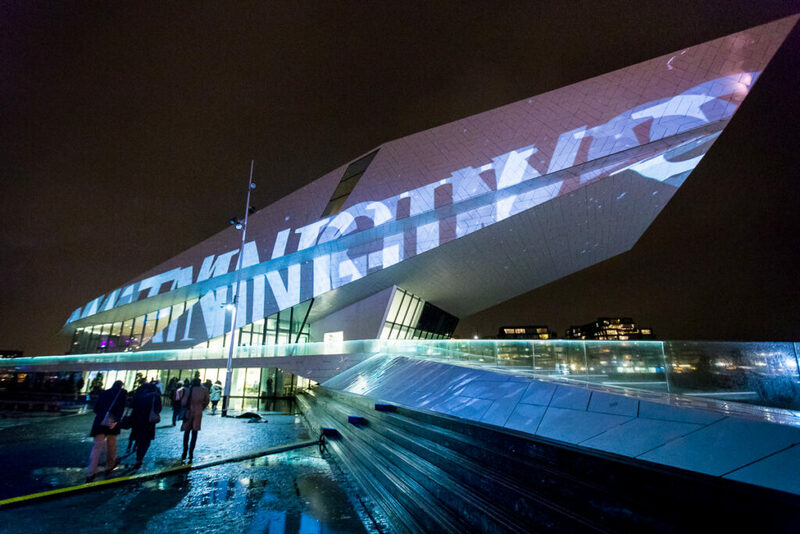 Integrated Systems Europe is the the largest AV and systems integration show in the world, and is taking place in Amsterdam, Holland, from February 6-9. 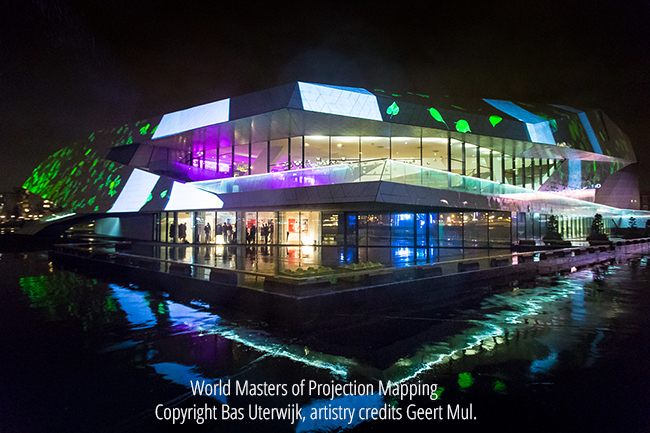 World Masters of Projection Mapping – Copyright Bas Uterwijk, artistry credits Geert Mul. The PT-RQ22K 3-Chip DLP™ SOLID SHINE laser model boasts the same compact dimensions and 20,000 lumens brightness as the PT-RZ21K series, a WUXGA/SXGA+ projector. The state of the art imaging engines include a Quad Pixel Drive and 240 Hz real motion processor. Heat-resistant phosphor wheels and solid-state laser modules serve vivid 4K+ images with industry leading brightness, contrast, and accuracy. The PT-RQ22K also offers BT.2020 emulation and supports premium HDR video content playback. Panasonic has combined class-leading picture quality and a low Total Cost of Ownership (TCO) by shielding the optical engine with heat-pipe based cooling, eliminating the need for an air filter. The whole projector can operate with no maintenance for very long periods of time, even in dusty environments. The PT-RQ22K has a dual light engine and can switch to a backup video signal instantaneously if the primary source goes down. The PT-RQ22K has a single-cable 4K DIGITAL LINK connection and is compatible with the newly launched Panasonic 12G-SDI interface board (ET-MDN12G10), as well as the full range of 3-Chip DLP™ Panasonic lenses. The EQ1 Series supports the latest 4K and Full HD video content, with two HDCP 2.2-compliant HDMI terminals to play DRM-protected content. It also offers a VESA-compliant mount．Installation, setup and control of the displays is simplified with a USB media player that displays 4K and Full HD content without the need for external cables or a Set-top Box. In a local network, content can also be updated using a master USB device, synced across multiple displays via LAN. Other technology showcased at the event that will be seen on Australian shores include a new 12,000-lumen laser projector, the PT-RZ120, which offers highly accurate colours and outstanding brightness in a compact chassis; and the PT-MZ770 Series of 7,500-lumens LCD Laser projectors, delivering low operating cost and high reliability to the education and corporate market. Australian pricing and availability will be announced closer to the launch date. For more information on Panasonic Media and Entertainment visit http://business.panasonic.com.au or call 132 600. 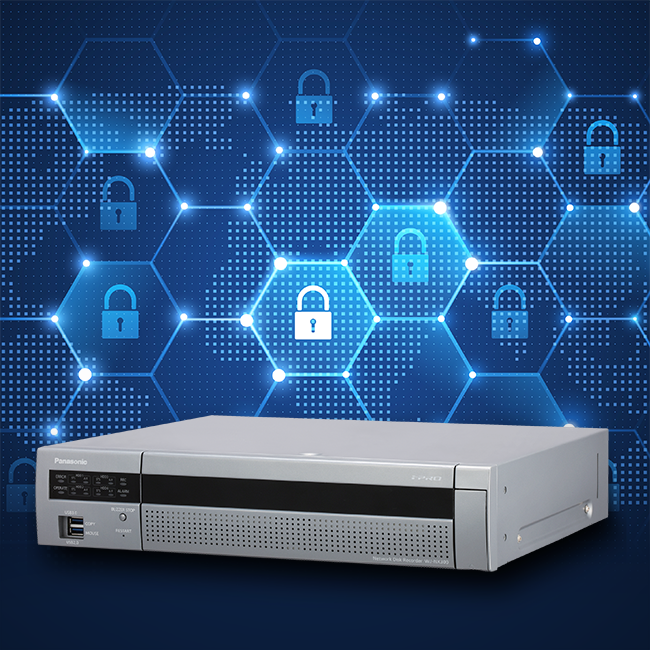 WJ-NX300 Recorder has impressive security credentials, offers streamlined installation, and delivers highly reliable data management. o 16 ch. expandable to 32 ch. camera input. Supports H.265 / H.264 mixed recordings. o No camera license fees with a default number of cameras; no annual license updates required. o Instantaneous power failure measures: Normal operation at instantaneous power failure within 200 ms; safe shutdown at power failure of 200 ms or more. The new Recorder will be available from March 2018 through Panasonic distributor BGW Technologies. For more information on Panasonic Security products visit http://business.panasonic.com.au/security-solutions/ or call 132 600.